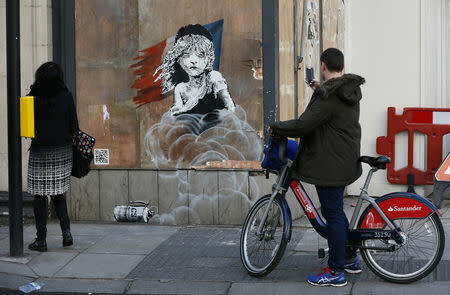 LONDON (Reuters) - A mural by British graffiti artist Banksy highlighting the alleged use of tear gas on migrants from the "jungle" camp in Calais has appeared on a hoarding near the French embassy in London. 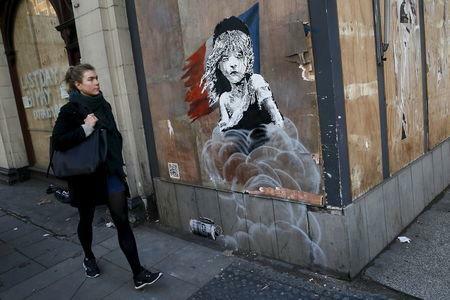 The stencilled image mimics the logo of the musical "Les Miserables" but in Banksy's depiction the character Cosette is engulfed by clouds of gas. A bar code links to YouTube footage that claims to show police raids on the camp earlier in January. The artist, whose identity has never been confirmed, last month painted a mural of late Apple founder Steve Jobs as a refugee on a wall at the Calais camp, referencing Jobs' heritage as the son of a migrant from Syria to the United States. 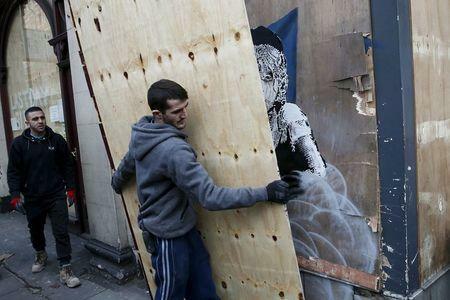 Other works in the French town that homes thousands of migrants from the Middle East and Africa who want to enter Britain also appeared on Banksy's website.